Sun., Oct. 8, 2017, 8:47 p.m. When Washington quarterback Jake Browning scrambled to his right and lofted an 11-yard throw into a crowd in the end zone, it looked as if the pass would be intercepted and the Huskies had squandered an early scoring opportunity. True freshman tight end Hunter Bryant emerged and displayed the jaw-dropping potential that’s made him a favorite among Husky fans and coaches. The 6-foot-3, 239-pounder from Eastside Catholic High in Sammamish ran from behind and jumped over California’s 5-10 cornerback Josh Drayden to pull down a brilliant touchdown catch that began UW’s 38-7 rout on Saturday night at Husky Stadium. Bryant’s first touchdown turned out to be the play of the game and the catalyst for No. 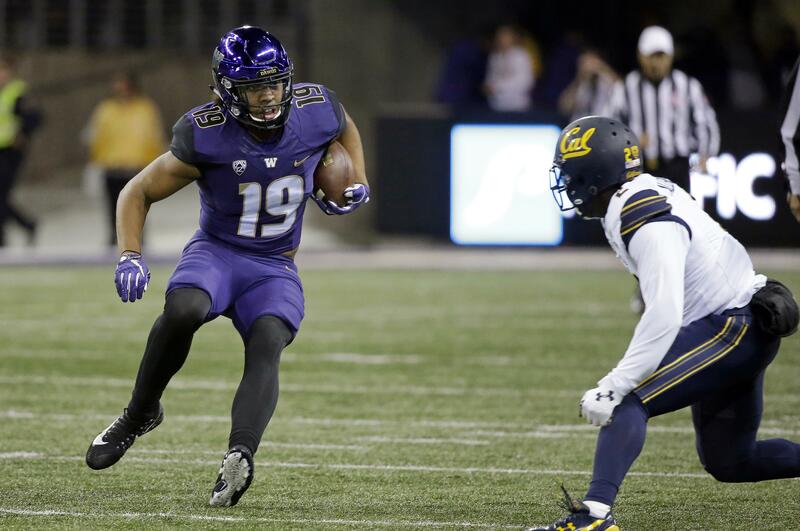 5 Washington (6-0, 3-0 Pac-12), which dominated on the scoreboard and statistically — UW outgained Cal 377 to 93 yards. For the second time this season, Bryant led the Huskies in receiving yards after finishing with 121 on nine receptions – both career highs. Bryant became the first UW tight end to gain 100 yards since Austin Seferian-Jenkins did it in 2012. Once again, quarterback Jake Browning was efficient while connecting on 27 of 40 passes for 215 yards and two touchdowns and receiver Dante Pettis finished with 10 catches for just 48 yards. But Bryant is filling a role that’s been missing in Washington’s passing attack. “He’s been making more and more plays and he’s pretty good with the ball in his hands,” Browning said. “So we’ve been giving him more and more, but you want to be careful about not overloading him too much cause that would take away from his playmaking. Despite catching just two passes for 14 yards in the first two games, Bryant ranks second on the team in receptions (19) and receiving yards (303). His 15.9 yards per catch is first among the Huskies. Bryant, who was ranked as the No. 2 tight end recruit in the nation, has started in each of the past four games. Published: Oct. 8, 2017, 8:47 p.m.